We're celebrating Moms over at Little Yellow Bicycle so I made a little something for my desk with the Fern & Forest Girl and Naturals collections they sent me. 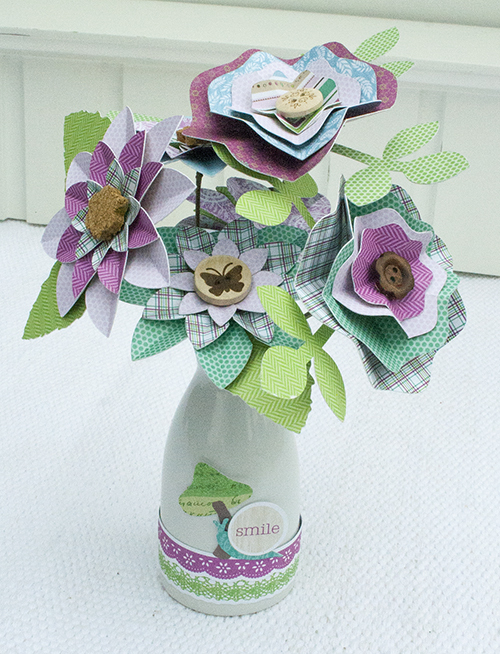 My hubby and kids bring home flowers for me often and we're always so sad when they begin to wilt so I thought it would be fun to create a bouquet of flowers that never die. I used cutting files and my CAMEO to create the flowers. Each flower had a small hole punched in the middle on them, which were the perfect size for the tiny sticks I found laying in my flower beds outside. I just inserted the sticks into the center hole in the flowers to create the stems and glued them together with liquid adhesive. I've had a couple of questions about this so here's a further explanation...To adhere the flowers to the stems, I threaded the stem through the paper flowers and flipped them over so that the flowers were facing down on my craft mat and the stem was in the air. Since the flowers are not flat the stem poked through the front quite a bit but that's okay for now. It actually helped it from falling over. I then added a generous amount of Scotch liquid adhesive to the stem and left them there to dry. Once dried, I turned the flowers right side up and cut off the top of the stem and placed buttons in the middle of the flowers. These adorable paper flowers sit right here next to my desk and are such a wonderful reminder of my girls. How adorable is that and the flowers will never die. Really cute Heather!! 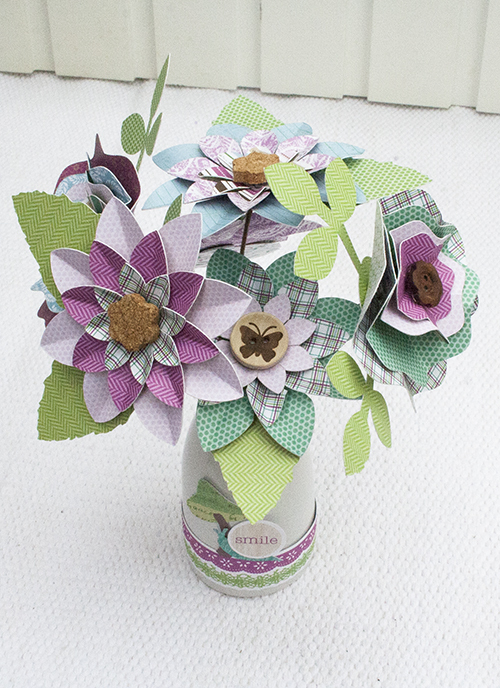 Love the different wood and cork buttons you used in the flower centers! Very fantastic and well-written post. Nice Arrangement of Flowers on cards!! !